The WHO, the UK Department for International Development, USAID, 13 pharmaceutical companies, like GlaxoSmithKline, the Bill & Melinda Gates Foundation and the World bank continue their global partnership to defeat 10 neglected tropical diseases (NTDs) by the year 2020. NTD is an umbrella term for bacterial, parasite and worm-infection which are responsible for illness, permanent disability and death of more then a billion people living in the poorest countries of the world. Controlling these diseases contributes to a decrease of illness, social exclusion and mortality and will directly contribute to the achievement of the Millennium Development Goals (MDG). On 30 January the WHO presented a roadmap at the Royal College of Physicians, which outlines the targets for the control, prevention and elimination of NTDs. The cooperation expand their existing drug donation programs till 2020; share expertise to accelerate research and development of new drugs; and provide more than US$785 million to support research and development efforts, strengthen drug distribution and implementation of health programs. The aim of WHO’s roadmap ‘accelerating work to overcome the Global impact of neglected tropical diseases’ is to defeat five NTDs: lymphatic filariasis (elephantiasis), guinea worm, blinding trachoma, sleeping sickness and leprosy, and control the further five NTDs: soil transmitted helminthes (intestinal worms), schistosomiasis, river blindness, Chagas and visceral leishmaniasis, by 2020. The first Global meeting in 2007, organized by the WHO, resulted in a shared commitment to support the WHO strategies. The new roadmap for implementation represents the next step forward in decreasing and, in many cases, finally ending the vast misery caused by these ancient diseases of poverty. Dr Caroline Anstey of the World Bank said. 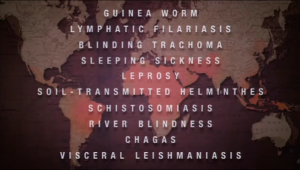 … these diseases are now being brought to their knees with stunning speed. With a boost to this momentum being made today, I am confident almost all of these diseases can be eliminated or controlled by the end of this decade. Many companies and organisations have worked for decades to fight these horrific diseases. But no one company or organisation can do it alone. Today, we pledge to work hand-in-hand to revolutionize the way we fight these diseases now and in the future.